396 pages, 8.5" x 11"
More than a dozen of the most respected names in medieval and Renaissance scholarship have come together to present a variety of fighting lore from the rich heritage of the European fight masters, circa 1350 to 1675. The list of legendary fighters and instructors contained within these pages reads like a combat honor roll and includes Johannes Liechtenauer, Fiore dei Liberi, Giacomo di Grassi, Henry de Sainct Didier, Joseph Swetnam and Hugues Wittenwiller. Historical documents translated and analyzed include Das Solothurner Fechtbuch, Le Jeu de la Hache, and the Gladiatoria. Because study of this martial literature requires one to be both scholar and fighter, the translators and interpreters featured in this book are all researchers and/or martial artists – thus serious students of the emerging field of historical fencing studies. These contributions from Dr. Sydney Anglo, John Clements, David Lindholm, Brian Hunt, Grzegorz Zabinski, Gene Tausk, Stacy Clifford and other modern scholars bring to life the words and fighting techniques of the masters of long ago. 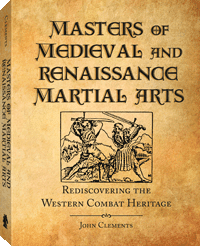 This rediscovery of combat skills that have been proven over the centuries will breathe new life into the study of medieval and Renaissance martial arts and preserve this knowledge for generations to come.